The application of orthodontic forces to teeth has been reported to induce changes in the periodontal ligament, dental pulp and supporting bone. The aim of this review was to assess the effect of orthodontic forces on the dental pulp. Searches were conducted in the Medline, Embase, Cochrane Central Register of Controlled Trials (CENTRAL), Scopus, Web of Knowledge, CINHAL and Google-Scholar databases. Clinical studies that assessed the application of orthodontic force on teeth and assessment of pulp tissues were considered. Two reviewers independently selected the studies, with three reviewers assessing study quality according to a grading system developed by the Swedish Council on Technology Assessment in Health Care. 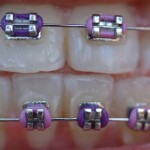 6 studies (involving 75 patients) assessed the effect of orthodontic forces on pulpal blood flow (PBF). 20 studies investigated the pulpal cellular responses to orthodontic forces. 4 studies investigated pulpal responses to orthodontic forces on traumatized teeth. Most studies were graded at moderate to low grade. A narrative summary of the included studies was presented. There is insufficient scientific evidence to prove that orthodontic forces jeopardize the human dental pulp in terms of reducing PBF and irreversible alterations in pulpal cellular response. However, a history of dental trauma maybe considered a risk factor for loss of pulp vitality during orthodontic treatment. Because of a lack of high-quality studies there is no conclusive scientific evidence for a relation between force level and dental pulp tissue reaction in humans. There is contradictory scientific support for a force-dependent reduction of blood flow. Javed F, Al-Kheraif AA, Romanos EB, Romanos GE. Influence of orthodontic forces on human dental pulp: A systematic review. Arch Oral Biol. 2014 Nov 24;60(2):347-356. doi: 10.1016/j.archoralbio.2014.11.011. [Epub ahead of print] Review. PubMed PMID: 25463910.
von Böhl M, Ren Y, Fudalej PS, Kuijpers-Jagtman AM. Pulpal reactions to orthodontic force application in humans: a systematic review. J Endod. 2012 Nov;38(11):1463-9. doi: 10.1016/j.joen.2012.07.001. Epub 2012 Sep 11. Review. PubMed PMID: 23063219.